The BABYBJÖRN BabySitter Balance Seat is designed perfectly to keep your baby safe and also help with their development. It has three distinct positions that were developed to promote play, rest and sleep. It folds down for easy transportation and the seat cover is made of a comfortable cloth that is both removable and reversible. A few extra facts about the Babysitter Balance bouncer is that all of the materials that your baby are made from high quality and are Öeko-Tex Standard 100 Class 1 certified which is a international standard for fabrics. 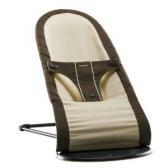 It is designed to support babies from 8 to 29lb safely.